PG&E officials on Monday said the cause of a transformer explosion that injured two people in San Francisco's Bernal Heights neighborhood this weekend is under investigation. The explosion, reported at 7:51 a.m. on Saturday, occurred outside a home at 269 Coleridge St., San Francisco Fire Department spokeswoman Mindy Talmadge said. One person was standing right over a grating when the explosion occurred below, talking to another person in the building who was leaning out the window, Talmadge said. "Talk about being in the wrong place at the wrong time," Talmadge observed. The person standing on the grate was taken to San Francisco General Hospital for treatment of minor burns, and was released today. The person who had been leaning out the window was also taken to the hospital for treatment of minor burns but released the same day, Talmadge said. 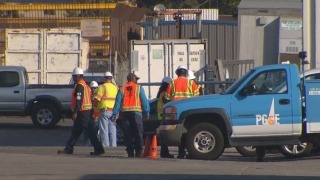 PG&E spokesman Joe Molica today said utility work crews were about five blocks away at the time of the explosion repairing a downed wire that was causing a power outage. Because they were in the area already, the employees were able to respond quickly to the blast and assist the victims, Molica said. Molica said PG&E is investigating the cause of the equipment failure and is also bringing in a third-party firm to conduct an independent investigation. They will consider whether the downed power line played a role, among other possible factors, he said. PG&E checked the electric distribution equipment in the neighborhood in June this year and found no issues, and conducted an inspection of the transformer in 2013, Molica said. There have been no outages on the involved circuit in the past year, he said. This is not the first time a transformer explosion in San Francisco has led to injuries. A Peninsula resident, Lisa Nash, suffered burns to 40 percent of her body in August of 2005 when a transformer in an underground PG&E vault exploded on Kearny Street in downtown San Francisco. Nash filed a lawsuit against PG&E in September of that year making claims of negligence and product liability, but later settled out of court.